This has been an Advent of scorched earth and whole communities burned to the ground, thousands of our brothers and sisters made refugees and displaced persons in their own hometowns. The stories of loss are heartbreaking — families and small business owners who have lost everything. The wildfires keep burning as I write these words, and it looks as if it is going to be another long week. 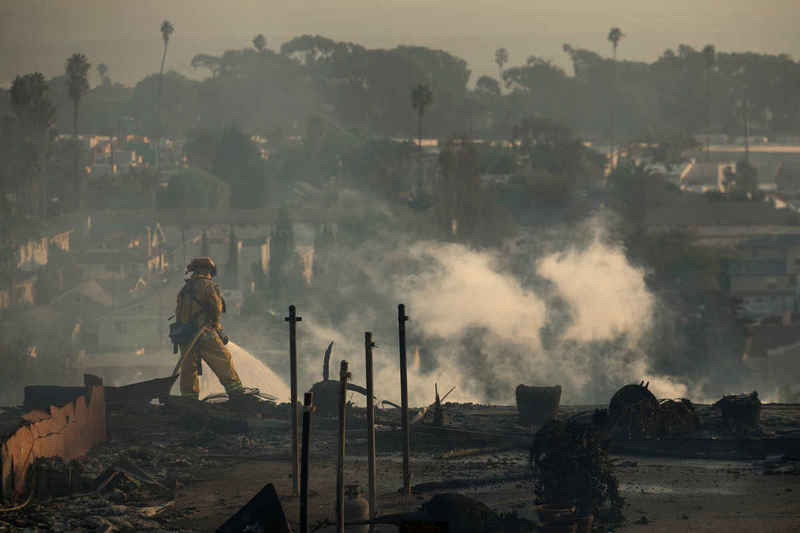 Even where fires are not burning, in many parts of the Archdiocese of Los Angeles the ash and smoke from the fires stings the eyes and makes it hard to breathe. And it is certainly possible to feel that way this week. Always it is the same question: Where is God to be found when natural disasters strike and bad things happen to good people? Why does he allow famines and fires and earthquakes and floods? In the face of loss and suffering, the answers that our Christian faith provides are not always satisfying — even if they are true. We always need to respect the pain of others; we have no idea what they are going through. And we need to remember: There is probably no greater challenge to faith than trying to keep believing in God’s love when it seems that he has left you and allowed you to suffer. There is a lot of talk these days in California about a “new normal” — people say drought and wildfires are the price we have to pay for climate change and global warming. I do not find these explanations satisfying either. The hard truth is that there are no easy answers. But that does not mean that the Lord is not in the fire. God is everywhere. Jesus said a sparrow does not fall from the sky in God’s creation without God knowing about it and caring about it. God is speaking in every moment, in every circumstance. But sometimes he speaks in a whisper. He asks us to listen, to have ears to hear. What he is telling us in these situations is that life is precious, but it is also uncertain and fragile. We should live for God every day and cherish every minute and not take anyone or anything in our lives for granted. It is sad, but we have a tendency to want to keep our distance from those who are in pain and suffering. We feel helpless sometimes, embarrassed. We do not know what to do. We sometimes look the other way when we see someone begging on the street or in front of the church. In times of disaster, these barriers of pride and indifference all fall down. We feel more clearly our common humanity, that we are all in this together. We realize how much we need one another and how much we need God. We have seen that again this past week, in the wake of the fires. The stories of loss have been matched by so many beautiful stories of extraordinary heroism and ordinary human kindness. The Lord is in the fire! He is there in all these stories of sharing and self-sacrifice, in all those who are opening their homes to strangers, in all those who are risking their lives to save others. The Lord is there in the outpouring of donations and in all of the volunteers serving selflessly in our Catholic Charities and St. Vincent De Paul Society. The Scriptures tell us that God will wipe away every tear from every eye. And Jesus calls us to be the ones who make good on this promise. “They shall be comforted,” Jesus commands. So, we must be the ones who will bring them comfort. We must be the ones who weep with those who are weeping, and we must be the ones who dry their eyes. And we need to be the ones also who stand by their side and help them to rebuild and go forward with courage and faith and hope in God. I pray that our Blessed Mother, in her tender love, will help all of us to listen and to hear the tiny whispering voice of God in these days after the fire.